Doris May Lessing CH, OBE (née Tayler; October 22, 1919 - November 17, 2013) was a British writer, author of novels including The Grass is Singing and The Golden Notebook. Lessing's fiction is commonly divided into three distinct phases although her influences were too numerous to categorize easily. She began as a Communist (1944–1956), when she was writing on the theme of radical social issues (to which she returned in The Good Terrorist (1985). During the 1960s, she was influenced by the psychology of British radical psychiatrist, R.D. Laing, initiating her psychological phase (1956–1969). Laing considered the symptoms of his patients as an expression of their reality and not as a mental illness per se. Later, Lessing turned to the study of Sufism. In conjunction with this new Sufi phase, she turned to science fiction writing, setting the Canopus series in space. Sufism offered her the same kind of idealism that Communism and radical psychiatry had–a key to the next stage of human development. Through her writing career, Lessing has expressed a sense of outrage over injustice and an attempt to find an alternate way of life and social system that would meet her own and humanity's aspirations. Lessing won the Nobel Prize for Literature in 2007. Doris was born to Captain Alfred Tayler and Emily Maude Tayler (née McVeagh), who were both English and of British nationality. Her father, who had lost a leg during his service in World War I, met his future wife, a nurse, at the Royal Free Hospital where he was recovering from his amputation. Alfred Tayler moved his family to Kermanshah, in Persia (now Iran), in order to take up a job as a clerk for the Imperial Bank of Persia and it was here that Doris was born in 1919. Her father purchased around one thousand acres of bush and the family then moved to the British colony of Southern Rhodesia (now Zimbabwe) in 1925 to farm maize. Her mother attempted to lead an Edwardian life style in the rough environment, which would have been easy had the family been wealthy; unfortunately, it was not. The farm was not successful and failed to deliver the wealth the Taylers had expected. Doris was educated at the Dominican Convent High School, a Roman Catholic convent all-girls school in Salisbury (now Harare). She left school aged 14, and thereafter was self-educated. She left home at 15 and worked as a nursemaid, and it was around this time that Doris started reading material on politics and sociology that her employer gave her to read. She began writing around this time. In 1937, Lessing moved to Salisbury to work as a telephone operator, and she soon married her first husband, Frank Wisdom, with whom she had two children. The marriage ended in 1943. Following her divorce, Doris was drawn to the Left Book Club, a communist book club, and it was here that she met her second husband, Gottfried Lessing. They were married shortly after she joined the group and had a child together, but the marriage also ended in divorce in 1949. Gottfried Lessing later became the East German ambassador to Uganda, and was murdered in the 1979 rebellion against Idi Amin. Because of her campaign against nuclear arms and South African apartheid, Lessing was banned from that country and from Rhodesia for many years. Lessing moved to London with her youngest son in 1949 and it was at this time her first novel, The Grass Is Singing, was published. Her breakthrough work though, was The Golden Notebook, written in 1962. In 1984, she attempted to publish two novels under a pseudonym, Jane Somers, to demonstrate the difficulty new authors faced in trying to break into print. The novels were declined by Lessing's UK publisher, but accepted by another English publisher, Michael Joseph, and in the US by Alfred A. Knopf. She declined a damehood, but accepted a Companion of Honour at the end of 1999 for "conspicuous national service". She has also been made a Companion of Literature by the Royal Society of Literature. On 11 October, 2007, Lessing was announced as the winner of the Nobel Prize for Literature. She was 87, making her the oldest winner of the literature prize at the time of the award and the third oldest Nobel Laureate in any category. She also stands as only the eleventh woman to be awarded the Nobel Prize for Literature by the Swedish Academy in its 106-year history. She told reporters outside her home "I've won all the prizes in Europe, every bloody one, so I'm delighted to win them all. It's a royal flush." In a 2008 interview for the BBC's Front Row, she stated that increased media interest following the award had left her without time for writing. Her final book, Alfred and Emily, appeared in 2008. Lessing died on November 17, 2013, aged 94, at her home in London. Lessing's fiction is commonly divided into three distinct phases: the Communist phase (1944–1956), when she was writing on the theme of radical social issues (to which she returned in The Good Terrorist (1985), the psychological phase (1956–1969), and after that the Sufi phase, which was explored in a science fiction setting in the Canopus series. Lessing's switch to science fiction was not popular with many critics. For example, in the New York Times in 1982 John Leonard wrote in reference to The Making of the Representative for Planet 8 that "One of the many sins for which the 20th century will be held accountable is that it has discouraged Mrs. Lessing…. She now propagandizes on behalf of our insignificance in the cosmic razzmatazz." Lessing replied: "What they didn't realize was that in science fiction is some of the best social fiction of our time. I also admire the classic sort of science fiction, like Blood Music by Greg Bear. He's a great writer." Unlike some authors primarily known for their mainstream work, she never hesitated to admit that she wrote science fiction. She was Writer Guest of Honor at the 1987 World Science Fiction Convention (Worldcon), and made a well-received speech in which she described her science-fictional Memoirs of a Survivor as "an attempt at an autobiography." Her novel The Golden Notebook is considered a feminist classic by some scholars, but notably not by the author herself, who later wrote that its theme of mental breakdowns as a means of healing and freeing one's self from illusions had been overlooked by critics. She also regretted that critics failed to appreciate the exceptional structure of the novel. As she explains in Walking in the Shade Lessing modeled Molly, to an extent, on her good friend Joan Rodker, the daughter of the author and publisher John Rodker. What the feminists want of me is something they haven't examined because it comes from religion. They want me to bear witness. What they would really like me to say is, 'Ha, sisters, I stand with you side by side in your struggle toward the golden dawn where all those beastly men are no more.' Do they really want people to make oversimplified statements about men and women? In fact, they do. I've come with great regret to this conclusion. When asked about which of her books she considered most important, Lessing chose the Canopus in Argos science fiction series (1979–1983). These books show, from many different perspectives, an advanced society's efforts at forced evolution (also see Progressor and Uplift). The Canopus series is based partly on Sufi concepts, to which Lessing was introduced in the mid-1960s by her "good friend and teacher," Idries Shah. Earlier works of "inner space" fiction like Briefing for a Descent into Hell (1971) and Memoirs of a Survivor (1974) also connect to this theme (Lessing's interest turned to Sufism after coming to the realization that Marxism ignored spiritual matters, leaving her disillusioned). Lessing grappled with many of the pertinent social and political issues of modernity. Her work was that of a seeker, and her readers were akin to followers. Her own searching became the subject of one of her most important novels. "The Golden Notebook (1962), in which a woman writer attempts to come to terms with her life through her art, is one of the most complex and the most widely read of her novels." Her complexity defies easy classification. Despite the wide range of genres and concerns, her writing is "unified by certain persistant concerns: the analysis of contemporary culture and social process; a sense of twentieth century history as catastrophic and an attempt to link this to personal unhappiness; a mystical and sometimes utopian emphasis on higher states of consciousness; an intense anger at social injustice; an interest in radical revisions of the self and of personal and sexual relationships. In 2007, Lessing won the Nobel Prize in Literature. She was described by the Swedish Academy as "that epicist of the female experience, who with scepticism, fire and visionary power has subjected a divided civilisation to scrutiny". Lessing is the eleventh woman to win the prize in its 106-year history, and also the oldest person ever to win the literature award. Lessing's largest literary archive is held by the Harry Ransom Humanities Research Center, at the University of Texas at Austin. The 45 archival boxes of Lessing's materials at the Ransom Center represent nearly all of her extant manuscripts and typescripts through 1999. Original material for Lessing's early books is assumed not to exist because Lessing kept none of her early manuscripts. Other institutions, such as McFarlin Library at the University of Tulsa hold smaller collections. ↑ Lesley Hazelton, 2007-10-11, `Golden Notebook' Author Lessing Wins Nobel Prize Bloomberg. Retrieved January 19, 2009. ↑ 2.0 2.1 2.2 2.3 Lessing. kirjasto.sci.fi Retrieved January 19, 2009. ↑ 3.0 3.1 Lesley Hazelton, "Doris Lessing on Feminism, Communism and 'Space Fiction'." The New York Times 1982-07-25  Retrieved January 19, 2009. ↑ 4.0 4.1 2007-10-11 Author Lessing wins Nobel honour. BBC News Online Retrieved January 19, 2009. ↑ Carol Simpson Stern. Doris Lessing Biography. biography.jrank.org. Retrieved January 19, 2009. 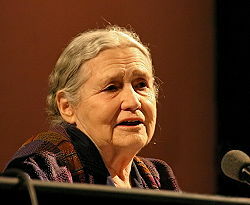 ↑ Kevin Billinghurst, Voices of America 2007-10-11 British Author Doris Lessing Wins Nobel Prize for Literature. Retrieved January 19, 2009. ↑ Adam Hanft, When Doris Lessing Became Jane Somers and Tricked the Publishing World (And Possibly Herself In the Process). Huffington Post. Retrieved January 19, 2009. The Diary of a Good Neighbour was published in England and the US in 1983, and If the Old Could in both countries in 1984, both as written by "Jane Somers." In 1984, both novels were re-published in both countries (Viking Books publishing in the US), this time under one cover, with the title The Diaries of Jane Somers: The Diary of a Good Neighbor and If the Old Could, listing Doris Lessing as author. ↑ Motoko Rich and Sarah Lyall, Doris Lessing Wins Nobel Prize in Literature. The New York Times. Retrieved January 19, 2009. ↑ David Wilkes, British author, 87, wins Nobel while out shopping. Daily Mail. Retrieved January 19, 2009. ↑ Lessing is the third oldest person to be awarded a Nobel Prize. Leonid Hurwicz was 90 when he was awarded the 2007 Nobel Memorial Prize in Economic Science in 2007. Raymond Davis Jr., also 87 when he won the 2002 Physics Prize, is 5 days older than Lessing. ↑ Pierre-Henry Deshayes. Doris Lessing wins Nobel Literature Prize. Herald Sun. Retrieved January 19, 2009. ↑ Nigel Reynolds, Doris Lessing wins Nobel prize for literature. The Telegraph(UK). Retrieved January 19, 2009. ↑ David Hinckley, Doris Lessing wins Nobel Prize for Literature. New York Daily News. Retrieved January 19, 2009. ↑ John Leonard (American critic),The Spacing Out of Doris Lessing. The New York Times. Retrieved October 16, 2008. ↑ Doris Lessing: Hot Dawns, Retrieved January 19, 2009. Interview by Harvey Blume in Boston Book Review. ↑ "Guest of Honor Speech," in Worldcon Guest of Honor Speeches, edited by Mike Resnick and Joe Siclari (Deerfield, IL: ISFIC Press, 2006), p. 192. ↑ Lessing's Early and Transitional Novels: The Beginnings of a Sense of Selfhood Retrieved January 19, 2009. ↑ Merriam-Webster's Encyclopedia of Literature. (Encyclopedia Britannica, 1995, ISBN 0877790426), 674. ↑ Sarah Crown, Doris Lessing wins Nobel prize. Look at her face. The Guardian(UK). Retrieved January 19, 2009. ↑ Author Lessing wins Nobel honour. BBC News. Retrieved January 19, 2009. ↑ Philip Marchand, Doris Lessing oldest to win literature award. Toronto Star. Retrieved January 19, 2009. ↑ Harry Ransom Humanities Research Center, Harry Ransom Center Holds Archive of Nobel Laureate Doris Lessing. hrc.utexas.edu. Retrieved January 19, 2009. ↑ Doris Lessing manuscripts. University of Tulsa. Retrieved January 19, 2009. This page was last modified on 13 October 2017, at 15:41.